Backpacking is exciting and a favorite activity for many people. However, without the right backpacking gear, the whole trip would turn out to be stressful and even depressing rather than fun. A common worry for most backpackers is how they will filter or purify their water while out in the wilderness. I bet you worry about that too! Don't you? In fact, this is one of the key considerations that will either make your trip memorable or otherwise. Choosing the best backpacking water filter is both tasking and confusing. With so many models and brands in the market to choose from, considerations to make can never be just a few. Do you prefer a purifier that will get rid of bacteria, viruses and other pathogenic organisms in your drinking water to make it safe? Do you need a UV purifier or something different? What are some of the best gravity induced water filters and pump filters in the market? What capacity of safe drinking water will you need during your backpacking trip? How fast will you need the water? Due to the constant change in technology, these questions can be difficult to answer for new and seasoned adventurers alike. Well, we make your work easier by providing an impartial and factual review of the best backpacking water filters and purifiers in the market. After repeated testing of more than 50 top purifiers and water filters, we came up with these 10 which are undoubtedly the top picks. Which is the best backpacking water filter? Honestly, purchasing the best backpacking water filter is not a cheap venture. The Katadyn Pocket Water Filter does not come cheaply either and is certainly not your ordinary water filter. While it boasts of being one of the most reliable and effective micro-filters available, it is suitable for the harshest environments across the globe. This micro-filter is therefore ideal and popular among various classes of people. The Katadyn product is an executive means to obtaining clean and safe drinking water in the wilderness irrespective of the available sources. No water filter beats the Katadyn Pocket Water Filter in durability. It features an impressively high quality construction for consistent use. To start with, the solid make and the sturdy design make this micro-filter your lifetime traveling companion. More importantly, the product delivers a complete water treatment that includes elimination of common water protozoa and bacteria. Being a ceramic filter, this travel gear does not require a lot of maintenance even with continuous use. Just as the name suggests, the Katadyn Pocket Water Filter is compact, lightweight and will easily fit into your pocket with unimaginable ease. This makes this purification equipment an ideal micro-filter for backpacking enthusiasts in very remote areas, relief workers in disaster prone areas, military officers on duty as well as foreign travelers. Easy to pump using the round pump handle. High water output hence fast. Versatile and can effectively be used as a life-straw. Costs a little bit higher than an ordinary water filter. The Katadyn Pocket Water Filter is durable and highly portable. Credited with a capacity of up to 50,000 liters of water and an unbeatable flow rate of about 1 liter per minute, the filter is ideal for small groups of campers, backpackers or hikers. Investing in this water filter gives a good return on investment for every penny you put in. While all the water filters reviewed here are great and you will find them very effective and efficient as per their specifications, none of them comes closer to the MSR Guardian Purifier Pump. It is effective, efficient and very durable. In addition, this water filter withstands all weather conditions including very hot and freezing temperatures, making it a gem for the varied seasons throughout the year. Do you therefore need to worry about your clean water needs while overseas? Read further and decide for yourself! The MSR Guardian Purifier Pump has a remarkable pumping capacity. It pumps a rapid 2.5 liters of water every minute without using batteries, chemicals or bulbs. This feature not only reduces the cost of use and maintenance of this purifier but also reduces the waiting time particularly when the users are a group of camping or backpacking enthusiasts who will need large quantities of water. The fact that this backpacking water filter has the ability to filter out all pathogens including viruses makes it ideal for international travel where water may contain viruses and other tiny bugs. MSR employs a new technology to ensure that the durability of this equipment is not put in doubt. It can withstand heavy and consistent use, harsh environments and falls or drops of up to 6 feet. Incredible, right? But that is not all. This purifier can filter and treat up to 10,000 liters of water without any replacement. Self-cleaning technology saves you the hassle of back-flushing like with most purifiers. Apart from the slightly higher price, the MSR Guardian pump has no notable downsides. The MSR Guardian Purifier Pump is your ultimate international companion. It is durable and will be your lifetime companion with amazing output. The fact that this equipment is self-cleaning gives you an easy time and safe water throughout your use. Although most pump filters are tiring, the technology used in this new MSR product makes it efficient and easy to operate. This is a pump you will find very interesting. Reward yourself with this equipment and get the value for your money and more. Give it to a friend as a gift and you will stay in their life for as long as they live. 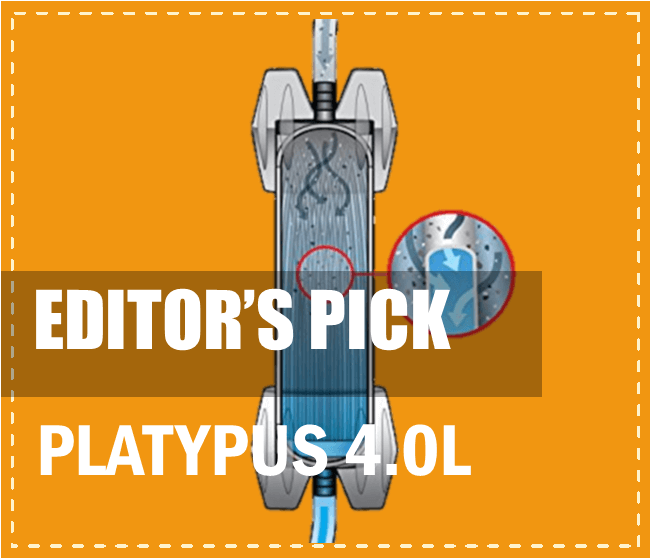 The Platypus GravityWorks takes our award of being selected as the editors' top choice. Do you want your water purified and made clean and safe with as minimum effort as possible? The Platypus GravityWorks Filter System efficiently and effectively removes all bacteria, protozoa and other pathogens from your water making it 99.99999% safe. The following incredible features make it the best hence the top choice in the market! This is one of the easiest water filters to use out there. The system comes with two water bags. Simply fill the bag marked "Dirty" with the water you intend to filter, hang it and relax. Clean water will move to the clean water bag. You do not need to pump as gravity will do all the work for you. Amazing, right? Again, imagine you have just got to your campsite in a remote countryside and you need water to quench your thirst and do some cooking! The GravityWorks Filter System has the speed to give you 4 liters of clean water in less than 10 minutes. Admittedly, this is sufficiently fast. One of the greatest advantages of the Platypus GravityWorks 4.0L Filter System is its ability to filter smaller and larger quantities of water in no time. More interestingly, the clean water bag acts as a storage unit. This gives you an opportunity to access clean water whenever you need it. Ability to treat and store about 8 liters of water. The lid needs a bit of care to close. The Platypus GravityWorks Filter System is an incredible gear for hikers, backpackers and campers. It is fast and easy to use. The gear is also lightweight and fairly compact making it easy to carry along. Moreover, the GravityWorks system saves you the hassle of making several trips to a water source as there is ample storage. Despite its slightly higher cost, this is an incredible outdoor gear that we can confidently forge for. If you are looking for a water purifier that will effortlessly provide clean water for your entire family when on a survival excursion, the Survivor Filter PRO 0.01 Micron Water Purifier Pump is your dream choice. To say that this military-quality water filter has made a remarkable mark in the outdoors water filtration industry is an understatement. This system's technology has set the bar for other survival water filters. Apart from the unrivalled 0.01 micron filter, the filtration takes place in three stages. The process begins with a sediment pre-filter, then an activated carbon filter and finally a membrane ultra-filter. This process ensures that all particulates such as silt and contaminants like chlorine and heavy unhealthy metals are eliminated. The ultra-filter also ensures that the tiniest viruses are gotten rid of making your water 99.9999% safe for drinking. Much as this sounds fictitious, you got to believe it because that is what it does. The Survivor Filter PRO 0.01 Micron Water Purifier Pump has a commendable flow rate. In less than a minute, you are assured of at least 500 milliliters of clean water without breaking any sweat. The pump can be used in three ways. Firstly, you can use the pump directly from a fresh water point. You can also use the pump to fill water into a portable container or in to the included cup. Finally, you can use the pump to effectively filter larger quantities of water for many campers or the entire family. Needs regular cleaning to get off the clogs. The Survivor Filter PRO 0.01 Micron Water Purifier Pump is a must have product for anyone who is interested in maintaining a safe supply of water during their outdoor expeditions. It is affordable, versatile and guarantees a consistent and reliable flow rate during use. The triple filtration process ensures that you obtain a clean and safe water devoid of any hazardous elements. This purifier promises a lot but delivers much more. The old model Katadyn Hiker Pro Microfilter is your most solid choice for general backpacking, hiking and camping expeditions. The Microfilter has for a long time claimed its spot as one of the bestsellers in its category. For more than half a decade now, this system is popular among hiking enthusiasts. Despite being a traditional water purifier, the Katadan Hiker Pro is small, compact and lightweight. These factors make it packable into a small piece for portability when hiking. It is also possible to hold it in one hand and use the other hand to effectively pump it during use. The Katadyn Hiker Pro Microfilter comes with additional accessories to ensure that your recreational activities are more interesting and lovely. For example, a pre-filter accessory, carrying case, water inlet and a cleaning as well as a maintenance booklet are all part of the package. These items not only make the the Katadyn Microfilter easy to carry but improves its efficiency during use. Very portable and hence perfect for backpacking. Needs a lot of energy to pump until you get used to it. The Katadyn Hiker Pro Microfilter is a top choice for any typical hiker. It is lightweight, compact and comes in a stylish carrying case. In addition, it also has bottle and bladder adaptors giving you the bonus options of being able to carry along some water. This micro-filter is an incredible option for super hikers who would like to keep it light during their excursions. The MSR MiniWorks EX Microfilter is a decent hand operated water purification equipment designed and produced by Mount Safety Research. This fairly priced product gives you the best quality for the money. After our tests and research, we conclusively found out that the product adequately blends good quality, reliable performance and unbeatable price. Equipped with a ceramic micro-filter that filters out everything bigger than 0.2 microns, the MSR MiniWorks EX Microfilter has the capability to reliably filter out bacteria, particles, protozoa, algae, fungi as well as other common bugs. Rest assured that your water is safe for consumption irrespective of its source.This feature makes this MSR product ideal for use in a wide range of environments. In addition, this ceramic filter adds a favorable taste to the water water. The MSR MiniWorks Ex consists of a basic package and assembly that makes it easy to use, to clean and to maintain. It is fast and will take you less than a minute to filter about 1 liter of water. Keeping the outlet sanitary is easy using the cap that comes with this product. Moreover, to avoid the intake of sediment from streams and water points, the hose is kept buoyant by the float. It is easy to clean, use and maintain. Durable and has a longer lifespan than most filters. Great design to curb cross contamination. Adds a nice taste to your water. Should be kept warmer in freezing conditions. Suited for use with bigger bottles. The MSR MiniWorks Ex Microfilter is a simple but effective water purifier for one or two hikers. It is easy to use and highly hygienic. While this water filter is not ideal for very cold and freezing weather, it still is a reliable outdoor equipment that will guarantee you clean water whenever you need it. It is highly recommended for people who need more than the basic water filters and purifiers. The Sawyer Mini Water filter is as affordable as water filters can get. Sawyer Products Limited has revolutionized the water purification industry. Therefore, even with the smallest of budgets, you no longer have to make your backpacking trips without an effective water filter. Without compromising performance and reliability, the Sawyer Mini Water Filter costs a fraction of what your ordinary water filter would cost. At about 20 bucks, it is one of the most affordable water filters available. Interestingly, this water filter will last to filter up to 100,000 gallons before it is due for replacement. It will therefore protect you from drinking contaminated water while hiking in the upcountry. The Sawyer Mini can be used both as a straw and as a water filter. This makes it ideal to use when you need to purify water into a container and when you want to drink directly from the water source. That is not all about its versatility as the water filter can also be used both to drink from a small-mouthed water bottle and an inline attachment to a hydration bladder. Small, light and highly portable. Easy drinking through the straw. Versatile and adaptable to various uses. Not ideal for treating larger quantities of water in one go. Needs frequent back-flushing to get rid of the clogs. The Sawyer Mini Water Filter is an ideal product for people working on a tight budget. It is easy to use, small in size, lightweight, affordable and highly versatile. In our opinion, we recommend this product to all hikers and backpackers who are generally skeptical about water filters and purifiers and would like to test the waters before committing. For all the good reasons, the LifeStraw Personal Water Filter has been making rounds in several blogs and among camping, hiking and backpacking enthusiasts. This lightweight and portable water filter is an astounding equipment that works absolutely just like the robust water filters that cost almost five times its price. It gives you a chance to access clean drinkable water in any part of the globe. The LifeStraw Personal Water Filter has been in the market for over one decade. During this time frame, this water filter has undergone improvements and sits at the top of the list when tested alongside industry leaders. It has been used by millions around the globe and continues to be a best seller. This is credited to its immense portability, affordability as well as the fact that it is reliable. The LifeStraw can filter more than 99.99% of protozoa and bacteria giving you safe drinkable water. It can also filter out bigger particles such as algae, fungi and other water bugs. Accessing clean water when you travel to the countryside or to a foreign country is not an easy task. However, it is worth noting that this outdoor equipment solves your worries when you are away from home and can't trust the water available. It comes in a sealed bag to provide convenient storage and comes in handy during emergencies. You may need a cup or container to drink from rather than lying on your belly at the water source every time you need to sip water. The LifeStraw Personal Water Filter is certainly your best solution to emergency drinking water needs. It is lightweight and you can easily hang it around your neck and carry along. This outdoor gear comes in handy when you need to drink water urgently. It is a recommended choice for trail runners, bikers and hikers. Are you planning to travel with your friends and family to a backpacking expedition far away from the United States and worried about the type of water you may have to survive on? Well, the LifeStraw Mission Water Purification System is your gateway to clean and safe drinking water anywhere in the world. Even if you are one of those individuals who do not trust water filters and purifiers then you will have to take this one more seriously. Just like most gravity-fed filters, the LifeStraw Mission Water Purification System is designed to filter and purify large amounts of water from any sources. The modular system consists of a large water bag for untreated water, a pre-filter, a hose and a water purifier. Simply fill the bag with untreated water and hang using the hanging handle so that gravity can do the rest of the work. Control the tap under the filter as appropriate. This is one of the few systems that will both filter your water and purify it. More importantly, out of the filters reviewed here, this is one of the few systems that will filter out up to 99.9999% of viruses in addition to protozoa, bacteria and algae. This is the main reason why it is recommended for campers traveling outside the United States and Canada. No pumping hence easy to use. Easy to control through the tap. Easy to pack and carry along. Needs to be kept warmer in freezing conditions. Costs slightly more than your ordinary filter. While most water sources in the United States do not have viruses, this cannot be said about most water sources in developing countries. The LifeStraw Mission Water Purification System is therefore an essential gear for people planning to travel away from the US and Canada. It eliminates metallic elements, algae, fungi, protozoa, bacteria and more interestingly, viruses. Trail runners and bikers are not left behind. The GRAYL Ultralight Water Purifier is a lightweight, portable purifier that suits trail runners, hikers and bikers who will need to keep hydrated throughout their expeditions. Nothing is as stressful as being in the countryside without a means to safe drinking water. The GRAYL Ultralight Water Purifier is a sure bet as it is highly effective and reliable. The GRAYL Ultralight Water Purifier is a unique equipment in the ultralight category of purifiers. Unlike most purifiers, this equipment has the ability to filter out at least 99.999% of bacteria, 99.999% of protozoans as well as 99.9999% of harmful viruses. The purifier can also filter hazardous chemicals such as chlorine and benzene as well as heavy metallic elements including lead, zinc and arsenic. To make your experience more enjoyable, the system improves water clarity, adds a memorable flavor and eliminates bad odor. The ONE PRESS technology cleans and purifies water in just 15 seconds. To use this purifier, all you need to do is to fill, press to clean and purify and you have your clean and safe drinking water. This technology therefore gives you access to safe water without sucking, pumping, squeezing or waiting. Finally, it is important to note that all the efficiency is achievable without the use of power butteries or ultraviolet bulbs. This makes this equipment easy and cheap to maintain. Comes with a filter bottle. May clog after a period of use. The GRAYL Ultralight Water Purifier is efficient, easy to use and very fast. Despite the fact that we ranked it the best pick for hikers and trail runners, this gear is versatile and fits a wide range of users. This is a fantastic equipment for all outdoor enthusiasts. Backpacking, hiking, camping, biking and survival enthusiasts will find it useful anywhere around the world as it has the ability to sanitize any water. It is a highly recommended item for globetrotters who do not want to carry along more bulky and heavier water filters. Do you need a water purifier or filter? Do you know the difference between filtration and purification? Well, this is the first step when you need to make a decision of which equipment to invest in. A water filter physically restrains protozoan cysts (giardia and cryptosporidium), silts and debris from getting into the clean water chamber. Although that statement defines succinctly what purifiers do, modern filters incoporate a technology that enables them to also filter out bacteria, viruses and fungi which are traditionally reserved for water purifiers. In addition to what filters do, purifiers also remove all minerals and chemical contaminants from water. Most purifiers in the market use reverse osmosis to perform the purification process. We advise that you read the description of the equipment you want to purchase thoroughly to comprehend what exactly it is capable of getting rid of from dirty water. Read this article to understand more about water filtration and purification. So what should your choice be? Well, a water filter is good enough for use in America, Canada and a few other developed countries where the main water impurities are protozoans, debris and bacteria while it is highly advisable to consider a purifier for international backpacking where water is highly infested with viruses. Who wants heavy outdoor gear when out camping, hiking, fishing or backpacking? The choice of a good backpacking water filter depends on how lightweight and packable you want your outdoor gear to be. A good backpacking water filter should be easy to carry along during your expedition. What amount of water will you possibly need during your trip? Are you a group or just an individual? How patiently can you wait for the water to purify and/or filter? These are some of the questions that should guide you into choosing a good backpacking water filter. There are expeditions where time is of great essence and you cannot afford to wait for a slower equipment. There are a wide range of filter types in the market and all these require knowledge to make the right choice. Gravity type filters are currently a common type. Their main advantage is that the gravity force will do all the work for you which makes it possible to process larger quantities of water with less effort. The treatment process is however much slower than the pumping process. Another challenge with them is that field cleaning is needed for optimum use. The second category is pump type filters. These filters can process the precise amount of water that you need. They are also ideal for pulling water from both shallow and deep wells unlike with gravity filters that are a hassle to fill up from shallow wells. Their disadvantages include the tiring task of working the pump and the fact that they are usually more bulky than most filter types. Ultraviolet light purifiers are another new entrants into the industry. They are fast and will deliver clean drinkable water in seconds. These filter types also do not require any replaceable cartridge or elements. However, they require power batteries and are not very effective with cloudy or silt water. The final category are squeeze and straw filters. They are small, highly portable and fast. However, straw type filters will only help you access treated water when you are at the source. For squeeze or bottle filters, the quantity of water you can carry along is limited. While it's not an easy task searching for and settling for a backpacking water filter, the process shouldn't be entirely impossible. 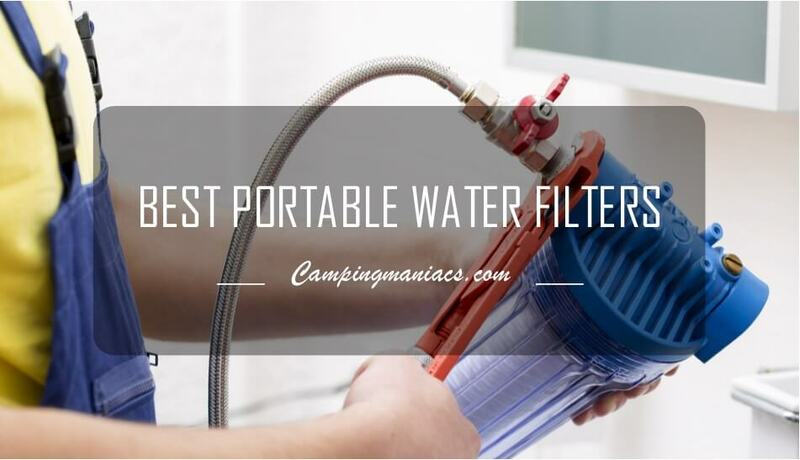 We have done our best to offer you a reliable list of the best water purifiers and filters that will see your camping and outdoor excursions being nothing but memorable. And whether it is a simple filter or a water purifier suitable for a group of backpackers, we've got your interests covered.